1890 A surge in bicycle use draws attention to the need for better roads. 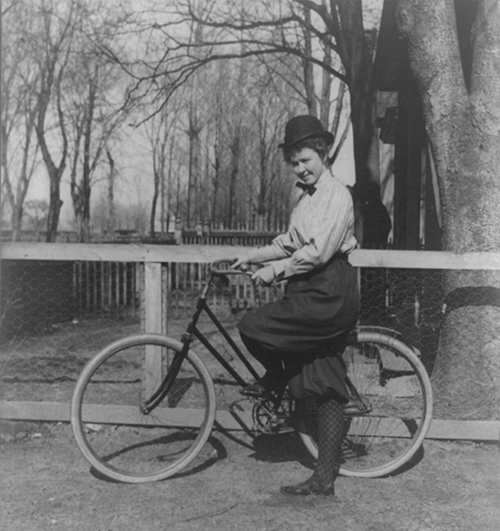 The mass production of the bicycle in the early 1890s improved mobility and raised awareness of the need for better roads. By 1890, over 1 million bicycles were being manufactured in the country each year. This new and innovative mode of travel was well received by the U.S. population, especially in urban areas. Bicycle enthusiasts were the first champions of what became known as the Good Roads Movement &lpar;late 1870s&dash;1920s&rpar;, because the prospect of traveling outside of one&apos;s city was dangerous due to the poor condition of roads. 1893 Office of Road Inquiry &lpar;ORI&rpar;, predecessor agency to FHWA, is established. President Grover Cleveland&apos;s Secretary of Agriculture, J. Sterling Morton, established the Office of Road Inquiry &lpar;ORI&rpar; within the Department of Agriculture with a $10,000 annual budget. General Roy Stone was the first chief of the ORI, the earliest predecessor of the FHWA. These letters established the agency&apos;s longstanding concept of partnership to achieve its goals. In the early years, partnerships were necessary because of the ORI&apos;s limited budget, but in later years, the partnerships would be enhanced because of their effectiveness in achieving the agency&apos;s goals. 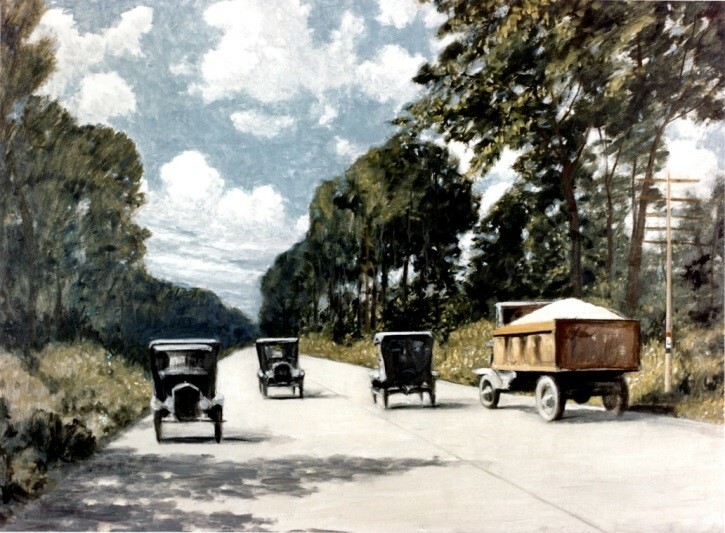 1895 First object&dash;lesson road constructed in Atlanta, Georgia. 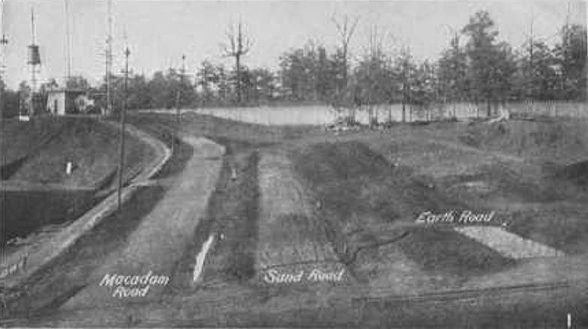 The first object&dash;lesson roads were constructed in Atlanta, Georgia, on the grounds of the 1895 Cotton States and International Exposition on the theory “seeing is believing.” Three roads were constructed of macadam, sand, and earth, respectively. The purpose of the object&dash;lesson roads was for the ORI &lpar;and later the Office of Public Road Inquiry and Office of Public Roads&rpar; to instruct local road builders across the country the proper methods of road construction and maintenance, demonstrate the importance of a properly constructed road vis&dash;a&dash;vis public sentiment, ascertain the best local material available for road building, and develop a basis for estimating costs for future road construction. These lessons were funded by the federal government and provided free of charge by the ORI at the request of a county or local community, provided they supplied the right&dash;of&dash;way, materials, labor teams, and fuel for the government&dash;provided road machinery. Within about 10 years, over 100 object&dash;lesson roads were constructed across 32 states, some as far west as North Dakota and Oregon. 1899 ORI becomes the Office of Public Road Inquiry &lpar;OPRI&rpar;. Following General Stone&apos;s resignation in 1899, Martin Dodge, a former president of the Ohio State Highway Commission, was appointed director of the ORI, which was renamed the Office of Public Road Inquiries &lpar;OPRI&rpar;. He expanded the promotional and technical activities of the agency, including cooperating with railroad companies and good roads promotional groups as a sponsor of Good Roads Trains. The trains toured the country from 1901 to 1903, demonstrating roadbuilding techniques with equipment borrowed from the manufacturers. Dodge established the agency&apos;s first field structure to continue the popular object lesson road program and keep in touch with local developments. He also launched the first inventory of all rural roads in the United States, which began in 1904 and took several years to compile. The survey found that out of 2,151,570 miles of rural public roads, only 153,662 miles had any kind of surfacing. 1901 OPRI&apos;s “tech transfer” initiatives expanded to the Good Roads Train. The Good Roads Train consisted of a traction engine, a road roller, a sprinkler, dump wagons, and farm wagons, which were loaded with several hundred people riding to the festival&apos;s major event, the object&dash;lesson road. The Good Roads Trains increased the impact of the object&dash;lesson roads by allowing the free use of the latest equipment, generating publicity over a wide area, providing a forum for meetings, and promoting formation of state good roads organizations and adoption of state road laws. The first Good Roads Train ran on the Illinois Central line from Chicago to New Orleans from April 20 to July 27, 1901. The nine&dash;car train stopped in 16 cities and five states. Sample roads, varying in length from 0.5 to 1.5 miles, were built at each stop. 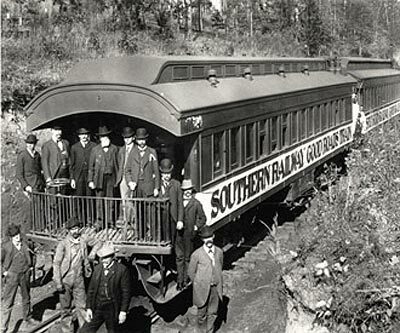 In the fall of 1901, the OPRI participated in the Southern Railway Good Roads Train, one of the most elaborate of the innovative Good Roads Trains of the era. At each major city, participants held a good roads convention and used borrowed equipment to build an object&dash;lesson road. 1905 OPRI becomes the Office of Public Roads &lpar;OPR&rpar;. Congress gives permanent status to the OPR within the Department of Agriculture. The OPRI was merged with the Division of Tests in the Department of Agriculture&apos;s Bureau of Chemistry to form the Office of Public Roads &lpar;OPR&rpar; under the Agriculture Appropriation Act of 1906, signed by President Theodore Roosevelt on March 3, 1905. The act provided that the director of the OPR “shall be a scientist and have charge of all scientific and technical work.” Logan Page, a geologist who in 1900 had established the OPRI&apos;s laboratory for testing road materials, was appointed director of OPR. The OPR had an annual budget of $50,000 and 10 employees. As director, Page began a series of investigations that won international acclaim, increased the agency&apos;s lecture schedule from 150 in 1905 to 1,135 in 1912, helped found the American Association of State Highway Officials, and was instrumental in securing congressional approval of the Federal&dash;Aid Highway Program in 1916. 1907 First national road inventory is published &lpar;for 1904&rpar;. In 1904, the first inventory of all rural roads in the nation was launched. Only about 7 percent of 2.1 million miles of rural roads had any kind of surfacing, not including 1,101 miles of toll roads in Pennsylvania and 497 miles of toll roads in Maryland that had stone surfaces. 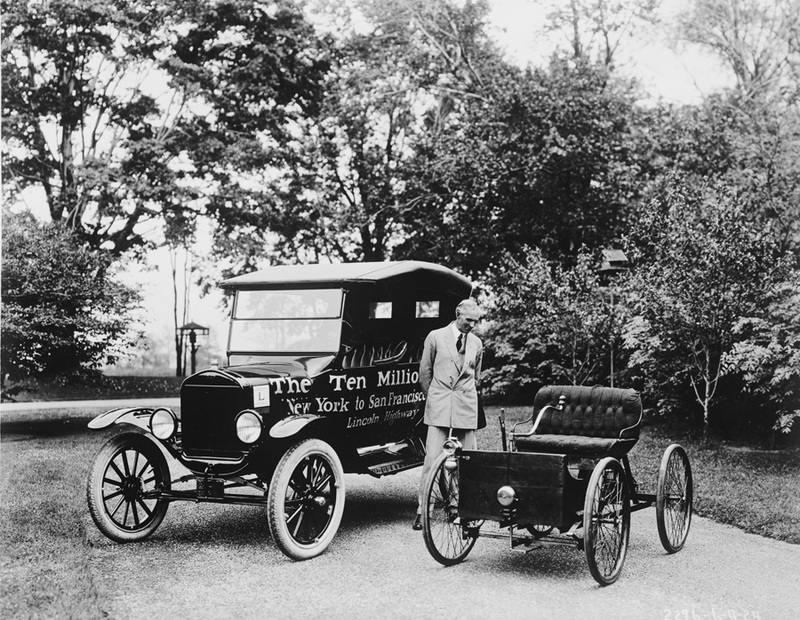 1908 Henry Ford&apos;s Model T arrives on the market. 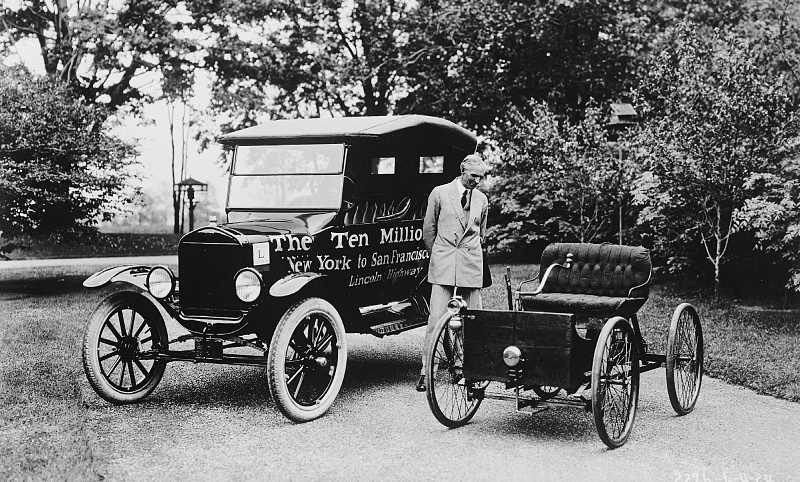 In 1908, Henry Ford&apos;s Model T arrived on the market. Assembly&dash;line production lowered the vehicle&apos;s price and made it affordable for the average American worker. Between 1913 and 1927, Ford factories produced more than 15 million Model Ts for a U.S. population of 119 million people. It soon became one of the most popular cars in the world. 1911 OPR publishes map showing proposed transcontinental, interstate, and truck line roads. 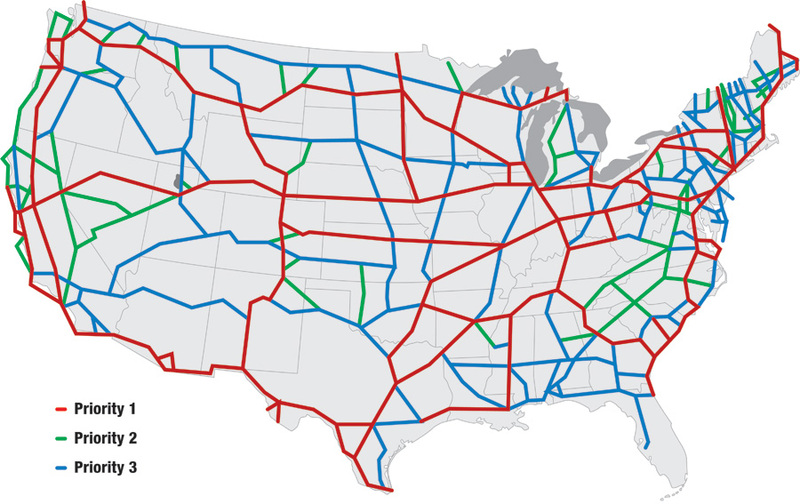 OPR publishes a map showing 12 proposed highways totaling 15,000 miles of transcontinental, interstate, and truck line roads to illustrate the tremendous impetus given to the nationwide movement for improved highways. 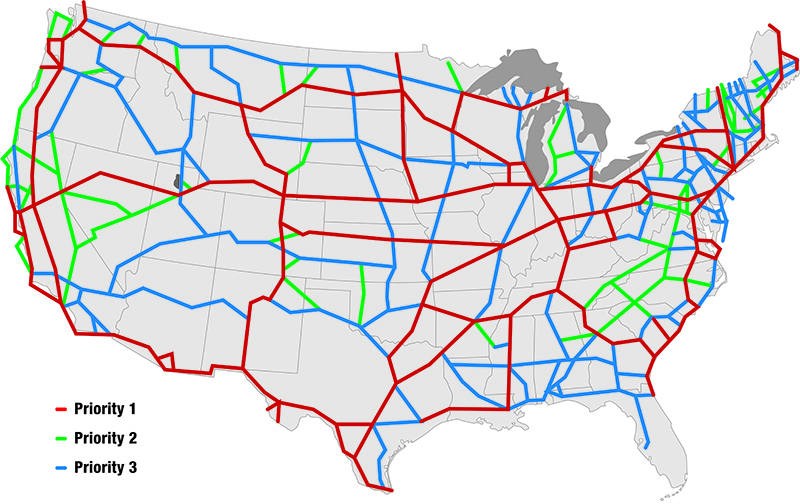 The highways, which were proposed by individuals, associations, and communities, include the Pacific Highway on the West Coast, the Montreal&dash;to&dash;Miami Highway on the East Coast, and an Ocean&dash;to&dash;Ocean Highway from Maryland to the State of Washington, as well as shorter routes such as the Du Pont Highway in Delaware and the Lincoln Way in Kentucky. 1912 First Annual Federal Aid Good Roads Convention. The late 1800s and early 1900s saw a growing interest in good roads across the country, resulting in the “Good Roads Movement.” Many good roads organizations were formed across the country and several National Good Roads Conventions were held in places such as St. Louis, Buffalo, and Indianapolis. The American Automobile Association &lpar;AAA&rpar; held the First Annual Federal Aid Good Roads Convention at the Hotel Raleigh in Washington, D.C., on January 16 and 17, 1912. The principal purpose of the convention was a thorough discussion of federal participation in road building and to settle on a definite plan that would satisfy those who believed in the principle of federal cooperation in highway work. 1913 The Lincoln Highway is formally dedicated. The Lincoln Highway was one of the earliest coast&dash;to&dash;coast highways for automobiles, running from Times Square in New York City to Lincoln Park in San Francisco. Some segments of the Lincoln Highway followed existing historic roads that had been in place for decades and even centuries. Much of the historic Lincoln Highway eventually became part of U.S. 30, and it is still known by that name in many areas. A historically important portion of the Lincoln Highway is the 1.3&dash;mile “Ideal Section” built in Indiana between 1922 and 1923 with funds from the Federal&dash;Aid Highway Program—a model section of road designed and constructed to not only meet the needs of current traffic, but also traffic needs for the next two decades. The Ideal Section was an early attempt to envision the type of highway that would evolve into today&apos;s interstate superhighways. 1914 Division of Road Maintenance is established within the OPR. 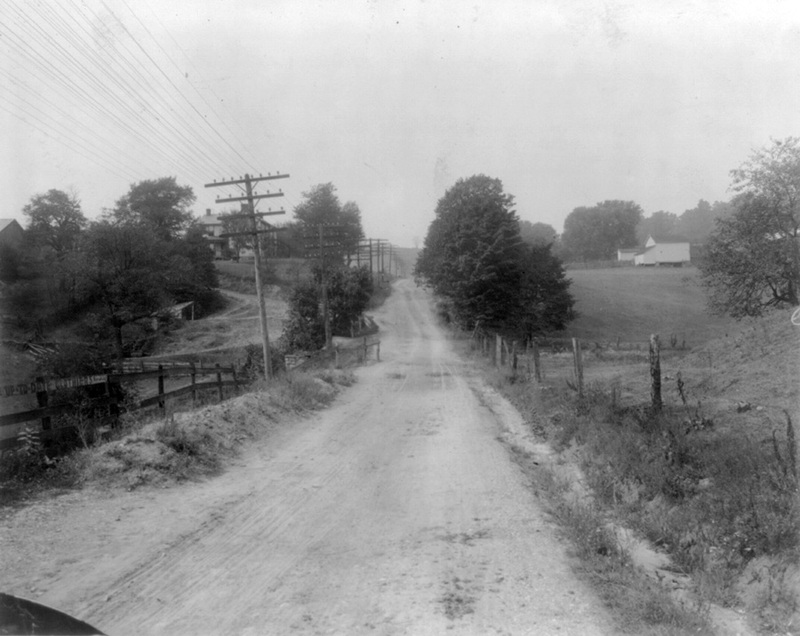 The OPR established the Division of Road Maintenance in response to growing demands from local officials for advice and assistance in preserving the many new roads that had resulted from a great increase in bond issues for road construction since 1910 and the general failure of local officials to make provision for maintenance. 1914 Division of National Park and Forest Roads is established within the OPR. The OPR established the Division of National Park and Forest Roads to take charge of certain roadwork in some of the national parks, in cooperation with the Department of the Interior, and of road work in some of the national forests, in cooperation with the Forest Service of the Department of Agriculture. 1914 The American Association of State Highway Officials &lpar;AASHO&rpar; is founded. The American Association of State Highway Officials &lpar;AASHO&rpar; was founded in Washington, D.C. It was the forerunner of today&apos;s American Association of State Highway and Transportation Officials &lpar;AASHTO&rpar;. 1915 OPR becomes Office of Public Roads and Rural Engineering &lpar;OPRRE&rpar;. In 1915, the Department of Agriculture merged work on farm drainage and irrigation with work on roads, renaming the OPR to the Office of Public Roads and Rural Engineering &lpar;OPRRE&rpar;. President Woodrow Wilson signed the Federal Aid Road Act of 1916. The law established a partnership among federal and state highway officials for “the construction of rural post roads,” with “construction” defined as “reconstruction and improvement of roads.” State highway agencies were to ensure that roads improved with federal aid were “properly maintained.” In addition, “all roads constructed under the provisions of this act shall be free from tolls of all kinds.” The act authorized $75 million over 5 years to be apportioned among the states based on three equal factors&colon; land area, population, and mileage of rural delivery routes and star &lpar;or contract&rpar; postal routes. The federal share was a maximum of 50 percent. The act also authorized $1 million annually for 10 years to improve roads and trails within, or partly within, the national forests “for the use or development of resources upon which communities within and adjacent to the national forests are dependent.” To satisfy federal requirements, any state receiving funds needed to have a highway agency capable of administering projects. 1916 The National Park Service is established as an agency within the Department of Interior through the National Park Service Organic Act. 1918 OPRRE publishes first issue of Public Roads magazine. 1918 OPRRE becomes Bureau of Public Roads &lpar;BPR&rpar;. The United States entered World War I in 1917, taking workers and materials away from road building. When the war ended in 1918, work on Federal&dash;aid highway projects quickly demonstrated the program&apos;s defects. The primary problem was that the states could use the funds on all existing or potential “rural post roads” outside cities. With virtually every road to choose from, the states spread Federal&dash;aid funds among all their political subdivisions, with little focus on interstate roads, statewide links, or state line connections with adjacent states. OPRRE was renamed the Bureau of Public Roads &lpar;BPR&rpar;, which was specifically charged with administering federal funding of road construction. 1919 The U.S. Army&apos;s first transcontinental motor convoy takes place. The first U.S. Army transcontinental motor convoy occurred in the summer of 1919 on the Lincoln Highway, with 81 motorized Army vehicles crossing the United States from Washington, DC, to San Francisco. The trip covered 3,251 miles in 61 days in a test of wartime mobility for the military. Many of the roads were impassable, and that meant frequent breakdowns of the military vehicles. The convoy was greeted warmly by communities across the country. Extensive publicity promoted the Lincoln Highway and good roads everywhere. One participant in the convoy was a young Army officer, Lt. Col. Dwight D. Eisenhower. The convoy experience and his later observations of the German autobahn network during World War II convinced him to support construction of the Interstate System when he became president. Eisenhower would later write in his memoir, At Ease, that “The old convoy had started me thinking about good, two&dash;lane highways, but Germany had made me see the wisdom of broader ribbons across the land.” His “Grand Plan” for highways, announced in 1954, led to the 1956 legislative breakthrough that created the Highway Trust Fund to accelerate construction of the Interstate System. 1921 Federal&dash;Aid Highway Act of 1921 resolves decade&dash;long debate over highway policy. BPR Chief Thomas MacDonald worked with AASHO to draft legislation that addressed major concerns regarding the Federal&dash;Aid Highway Program. The Federal&dash;Aid Highway Act of 1921, signed by President Warren G. Harding, provided a number of changes to the Federal&dash;Aid Road Program, including limiting eligibility for federal aid to up to 7 percent of the roads in each state. At least 60 percent of those roads were required to be linked at state lines and paved surfaces were required to be at least 18 feet wide. The act was designed to balance interstate and farm&dash;to&dash;market interests while retaining the federal&dash;aid principle. The Federal&dash;Aid Highway Act of 1921 resolved decade&dash;long debates over highway policy and unified the highway community, resulting in a highway improvement boom that began in the 1920s. 1922 The Pershing Map, the first road map showing priority roads in the event of war, is completed. In 1922, the BPR commissioned Gen. John J. Pershing to draw up the Pershing Map for construction purposes and to give the government a clear understanding of which roads in the United States were the most important in the event of war. The Pershing Map was the first official topographic road map of the United States. It included 78,000 miles of roads with an emphasis on coverage in coastal areas and border crossings. Most of the roads identified in the Pershing Map were incorporated into the Federal&dash;aid system of highways. The War Department&apos;s position was that a highway network that was adequate for industrial and commercial needs would also adequately serve military requirements. 1924 Congress launches the first road construction program in national parks. Congress allocated funds for construction of roads, trails, and bridges in national parks. The legislation authorized $2.5 million for each of fiscal years 1924 through 1927 “to construct, reconstruct, and improve roads and trails, inclusive of necessary bridges, in the national parks and monuments.” The legislation was not named, but is referred to by NPS as the Roads and Trails Act. 1926 National Road becomes part of U.S. 40. The National Road, in many places now known as Route 40, was built between 1811 and 1834 to reach the western settlements. It was the first federally funded road in U.S. history. George Washington and Thomas Jefferson believed that a trans&dash;Appalachian road was necessary for unifying the young country. In 1806, Congress authorized construction of the road, and President Jefferson signed the act establishing the National Road. In 1811, the first contract was awarded, and the first 10 miles of road were built. As work on the road progressed, a settlement pattern developed that is still visible. Original towns and villages are still found along the National Road. The road, also called the Cumberland Road, National Pike, and other names, became Main Street in these early settlements, earning it the nickname “The Main Street of America.” In the 1800s, it was a key transport path to the West for thousands of settlers. In 1912, the road became part of the National Old Trails Road, and its popularity returned in the 1920s with the automobile. Federal aid became available for improvements in the road to accommodate the automobile. In 1926, the road became part of U.S. 40 as a coast&dash;to&dash;coast highway running from Atlantic City to San Francisco. 1926 AASHO approves the U.S. numbered highways, and the new U.S. shields begin to appear around the country. AASHO suggested the Secretary of Agriculture establish a task force to consider uniform marking and signing. 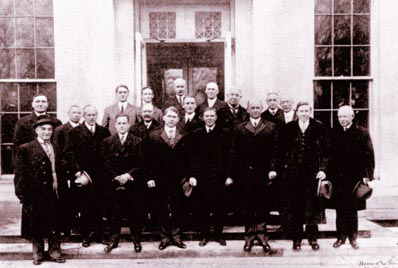 The Secretary created the Joint Board on Interstate Highways in 1925, consisting of three BPR officials and 23 state highway officials. They conceived the U.S. numbered highway system and the original U.S. shield for identifying the routes, as well as signs for other purposes such as STOP, YIELD, RR Crossing, etc. In late 1925, the Secretary submitted the proposal to AASHO for consideration, because all the roads in question were owned and operated by the states. After much debate and change, AASHO approved the plan by ballot of its members on November 11, 1926. The state highway agencies then put the voluntary plan into effect. 1926 Cooperative agreement signed for road construction in national parks. Secretary of Agriculture W. M. Jardine signed a cooperative agreement, developed by NPS Director Stephen Mather and BPR Chief Thomas MacDonald, for the engineering and construction of roads by BPR in national parks on a reimbursable basis. 1929 The stock market crash marked the beginning of the Great Depression. From 1929 to 1939, the United States experienced the deepest and longest&dash;lasting economic downturn in this country&apos;s history—the Great Depression. It began soon after the stock market crash in October 1929, which resulted in catastrophic loss and a steep decline in consumer spending leading to declines in industrial output and lay&dash;offs. At its peak in 1933, 25 percent of all workers and 37 percent of all non&dash;farm workers were completely out of work. Thirteen to fifteen million Americans were unemployed and nearly half of the country&apos;s banks had failed..
1932 The Emergency Relief and Construction Act of 1932 creates jobs for the unemployed. The legislation enabled under President Herbert Hoover, and later adopted and expanded by President Franklin D. Roosevelt, released funds for public works across the country as a temporary means for providing employment. 1933 National Industrial Recovery Act &lpar;NIRA&rpar; signed by President Franklin D. Roosevelt implements New Deal policies. In his effort to put people back to work during the Great Depression, Roosevelt implemented a number of programs collectively named the New Deal &lpar;1933&dash;1938&rpar;. New Deal policies sought to stimulate employment through a variety of federal programs. The Public Works Administration &lpar;PWA&rpar;, part of the New Deal of 1933, was a large&dash;scale public works construction agency in the United States. Construction began on August 5, 1933, in Utah on the first highway project under the act. By August 1934, 16,330 miles of new roadway projects were completed. During its two years of existence, 27,055 miles of new highways were constructed across the country under the act. The PWA built thousands of miles of roads employing 1,714,797,910 person&dash;hours from 1933&dash;1939, the equivalent of an estimated 137,404 individuals employed continually for six years, paying $1.2 billion in wages in 1939 dollars. 1933 Going&dash;to&dash;the&dash;Sun Road in Glacier National Park is formally dedicated. The Going&dash;to&dash;the&dash;Sun Road was one of the first NPS roadways specifically intended to accommodate the automobile tourist. The 51&dash;mile road passes alongside the glacial lakes, alpine forests, and sheer cliffs of Glacier National Park. The road had a significant impact on road design policy throughout the National Park System and is an excellent example of the NPS&apos;s sensitive response to topography and scenic features. Bridges, retaining walls, and guardrails were specified to be made of native materials. Rock excavated from adjacent mountainsides during construction was used to construct structures alongside the road. Large blasts of explosives were not allowed, since it would cause too much destruction to the landscape. As a result, only small blasts of explosives were used. Going&dash;to&dash;the&dash;Sun Road was a great feat of engineering because of the many obstacles faced by engineers and laborers during the construction of the winding road. 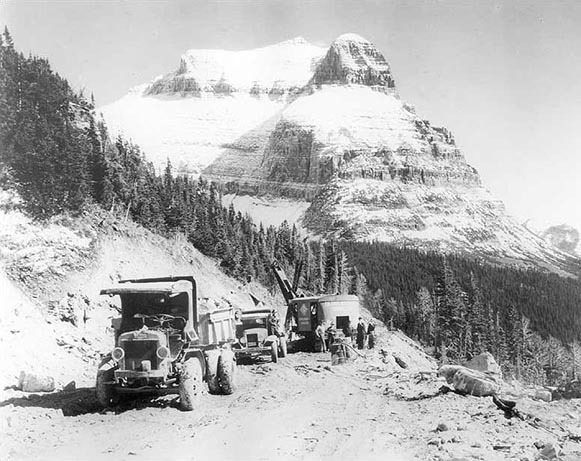 Sheer cliffs, short construction seasons, 60&dash;foot snowdrifts, and tons of solid rock made road building across the Continental Divide a unique challenge. The road is an early example of the collaboration between NPS and BPR. In 1983, Going&dash;to&dash;the&dash;Sun Road was included in the National Register of Historic Places, and in 1985 it was made a National Historic Civil Engineering Landmark. 1935 AASHO releases first national standard for signs, markings, signals, and safety islands known as the Manual on Uniform Traffic Control Devices &lpar;MUTCD&rpar;. Having adopted highway signs, AASHO released the Manual and Specifications for the Manufacture, Display, and Erection of U.S. Standard Road Markers and Signs in January 1927. 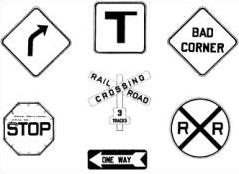 The manual described signs for rural roads based on standard shapes, colors, and symbols. The American Engineering Council in 1929 and the National Conference on Street and Highway Safety developed separate manuals in 1930 for signing in urban areas. The manuals differed in some ways, and the urban manual covered markings, signals, and safety islands that AASHO&apos;s manual had not addressed. To develop a single manual, AASHO and the National Conference on Street and Highway Safety formed the Joint Committee on Uniform Traffic Control Devices in 1932. AASHO released the Manual on Uniform Traffic Control Devices for Streets and Highways &lpar;MUTCD&rpar; in 1935. The BPR adopted the MUTCD as a national standard for signs, markings, signals, and safety islands. 1935 Construction of the first section of the Blue Ridge Parkway begins near the North Carolina&dash;Virginia border. The Blue Ridge Parkway was built to connect Shenandoah National Park to the Great Smoky Mountains National Park and runs along the Blue Ridge Mountains. It has been the most visited unit of the National Park System almost every year since 1946, and it is often referred to as “America&apos;s Favorite Drive.” Approximately 50 percent of the parkway was completed by the 1950s by private contractors, and a variety of New Deal public works programs such as the Works Progress Administration, the Emergency Relief Administration, and the Civilian Conservation Corps. Construction of the parkway was completed in 1966, with the exception of a 7.7&dash;mile stretch that included the Linn Cove Viaduct around Grandfather Mountain, which was completed in 1987. The construction of the parkway created many jobs in the region, particularly during the Great Depression. The Linn Cove viaduct was an example of National Park System construction sensitive to environmental needs. A traditional cut&dash;and&dash;fill road would have caused substantial damage to Grandfather Mountain. The viaduct was constructed by placing 153 fifty&dash;ton segments from the top&dash;down to minimize disturbance to the natural environment, eliminating the need for a pioneer road and heavy equipment on the ground. The only trees cut were those directly beneath the superstructure. 1936 Construction of the Hoover Dam is completed with U.S. 93 along the dam&apos;s crest. 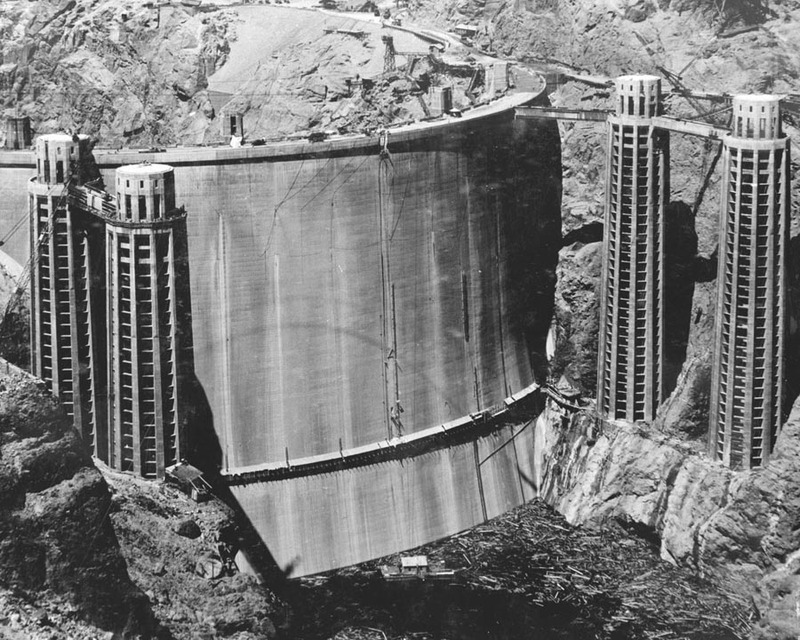 After planning for over a decade, the Hoover Dam was constructed between 1931 and 1936 during the Great Depression, with U.S. 93 running along the crest of the dam. Rising 726.4 feet, Hoover Dam was the world&apos;s tallest dam when it was built. 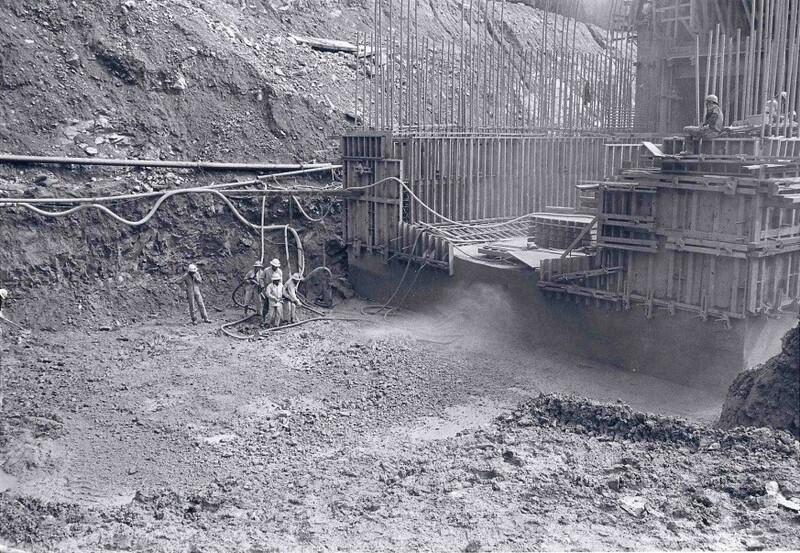 The dam was dedicated on September 30, 1935, by President Franklin D. Roosevelt, and it was formally completed on March 1, 1936, when the construction consortium turned over the dam to the federal government. U.S. 93 was later rerouted to bypass the Hoover Dam, a project that was completed in October 2010. Hoover Dam employed a total of 21,000 men during its 5 years of construction. 1937 Golden Gate Bridge opens to traffic. The Golden Gate Bridge connects San Francisco to Marin County. At the time of its opening, at 4,200 feet, the Golden Gate Bridge had the longest suspension bridge main span in the world. The bridge&apos;s two main towers each rise 746 feet above the water and are strung with 80,000 miles of cable. As the states struggled financially to rebuild highways after World War I and during the Great Depression, tolling became a way to finance large&dash;scale projects, such as the Golden Gate Bridge. By issuing bonds, a toll authority received funds from investors who would be repaid, with interest, from toll receipts. 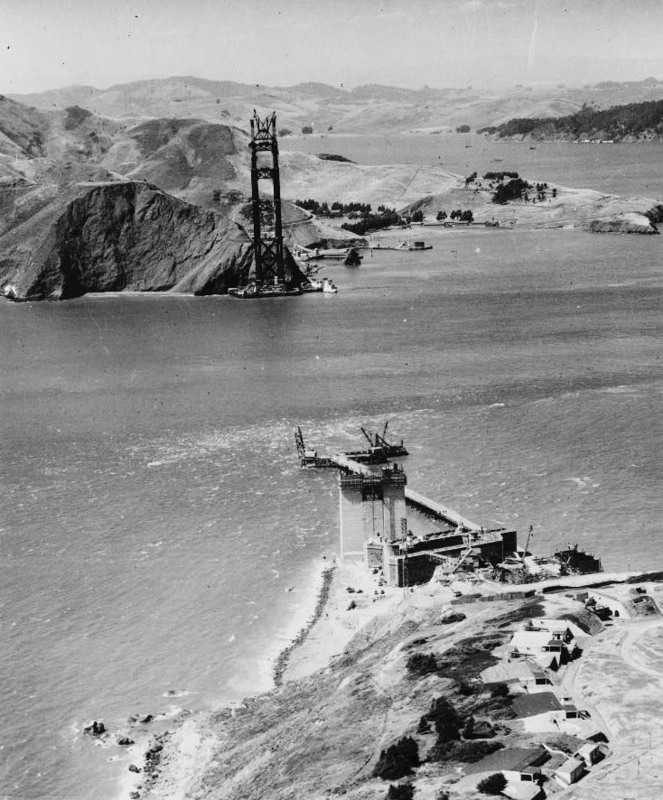 The Golden Gate Bridge and Highway District, authorized by an act of the California Legislature, was incorporated in 1928 as the official entity to design, construct, and finance the Golden Gate Bridge. Construction began in 1933 and was completed in 1937. The project cost more than $35 million and was completed ahead of schedule and $1.3 million under budget. 1938 Route 66 is completed under New Deal initiatives. Stretching from Chicago, Illinois, to Los Angeles, California, Route 66, also known as “The Mother Road” and “The Main Street of America,” was one of the country&apos;s major thoroughfares for nearly half a century. Route 66 became one of the most famous roads in America, having been popularized in American culture through books, songs, music, magazines, movies, and television shows. During the Dust Bowl of the 1930s, it was the primary route for the migration of farm workers from the Midwest to California. The migration continued during World War II due to opportunities in California. During World War II, it also became one of the key routes for moving military equipment across the country. Due to the efforts of the U.S. Highway 66 Association, Route 66 became the first highway to be completely paved in 1938. In the 1950s, Route 66 became the main highway for vacationers heading to Los Angeles. 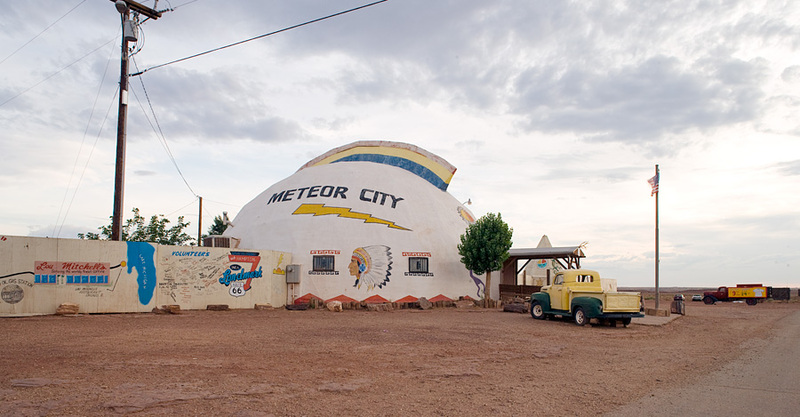 The traffic along Route 66 also resulted in the opening of many mom&dash;and&dash;pop establishments, such as restaurants, motels, and gas stations along the route, to service the needs of passing motorists. Route 66 captured the imagination of generations of Americans like no motor highway did before, and the many sights and roadside attractions along the route became an important part of the tourism experience of “getting your kicks on” Route 66. The construction of the Interstate Highway System resulted in the eventual decline of Route 66 and correspondingly many of the roadside attractions. Portions of the road have now been designated as National Scenic Byways or as “Historic Route 66” in several states, including Arizona, New Mexico, Illinois, and Missouri. 1939 Report to Congress on “Toll Roads and Free Roads” contains the first formal concept of the Interstate Highway System. BPR produced the report to “present more clearly the need for a system of interregional through highways and the important relationships of such a system to the requirements of the national defense.” The report defined the location of three east&dash;west and three north&dash;south highways and also indicated that financing of the full costs of such highways by direct toll collections was not possible. The report discussed the development of a composite street and highway system across the country and called for appropriate and coordinated contributions by the federal and state governments and by all county and municipal subdivisions. The report was submitted to President Franklin D. Roosevelt by Secretary of Agriculture H. A. Wallace with concurrence by Secretary of War Harry H. Woodring. In “Summary of Findings and Recommendations,” the report listed five “desirable joint contributions of the Federal and State Governments”&colon; &lpar;1&rpar; the construction of a special, tentatively defined system of direct interregional highways, with all necessary connections through and around cities, designed to meet the requirements of the national defense in time of war and the needs of a growing peacetime traffic of longer range; &lpar;2&rpar; the modernization of the Federal&dash;aid highway system; &lpar;3&rpar; the elimination of hazards at railroad grade crossings; &lpar;4&rpar; an improvement of secondary and feeder roads, properly integrated with land&dash;use programs; and &lpar;5&rpar; the creation of a Federal Land Authority empowered to acquire, hold, sell, and lease lands needed for public purposes and to acquire and sell excess lands for the purpose of recoupment. 1939 BPR becomes Public Roads Administration &lpar;PRA&rpar; and is shifted from Department of Agriculture to the newly formed Federal Works Agency. President Franklin D. Roosevelt signed into law the Reorganization Act of 1939 that gave him authority for two years to reorganize existing departments, agencies, bureaus, commissions and committees of the federal government to achieve efficiency and economy. Under Reorganization Plan 1 the Federal Works Agency was created which included the Bureau of Public Roads &lpar;renamed the Public Roads Administration&rpar;, the Public Buildings Branch of the Procurement Division, the Branch of Buildings Management of the National Park Service, the United States Housing Authority, the Federal Emergency Administration of Public Works, and the Works Progress Administration. 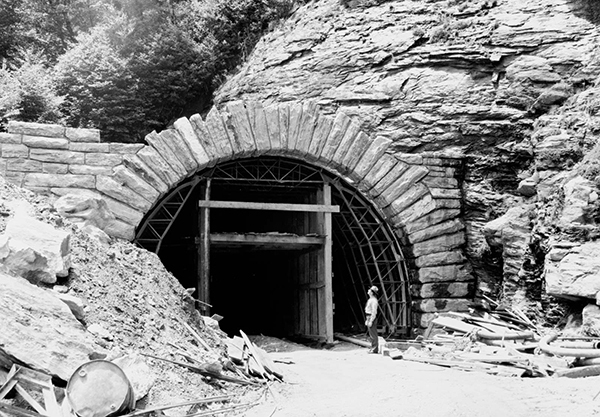 Between 1939 and 1949, the Federal Works Agency administered a number of public construction, building maintenance, and public works relief functions and laws. 1940 The Pennsylvania Turnpike opens to the public. Some states created independent authorities to sell bonds and build toll roads. With help from federal funding sources, Pennsylvania sold sufficient bonds to open a 162&dash;mile stretch of highway, called the Pennsylvania Turnpike, in October 1940. It was the first long&dash;distance stretch of four&dash;lane, limited&dash;access &lpar;i.e., high&dash;speed&rpar; highway in the United States. The toll road was successful in drawing ridership and set the standard for the future design and construction of the superhighway, although many accidents occurred because of reckless speeding as the speed limit was not initially enforced. Other states began considering construction of turnpikes, but America&apos;s entry into World War II put the ideas on hold for the duration. The road had 12&dash;foot wide lanes paved in concrete and provided the design model for, and was termed the “granddaddy” of, the modern interstate system. 1941 Attack on Pearl Harbor sparks U.S. involvement in World War II. The U.S. involvement in World War II lasted 4 years &lpar;1941&dash;1945&rpar;. At the onset of World War II, government purchases rose significantly, leading to the rapid expansion of industrial output by investing vast amounts of funds into business to expand production. During this time, war traffic pounded the highways. Despite earlier Federal initiatives to add more strategic routes to the network, many of the existing roads and bridges did not meet adequate standards for military or even civilian traffic. 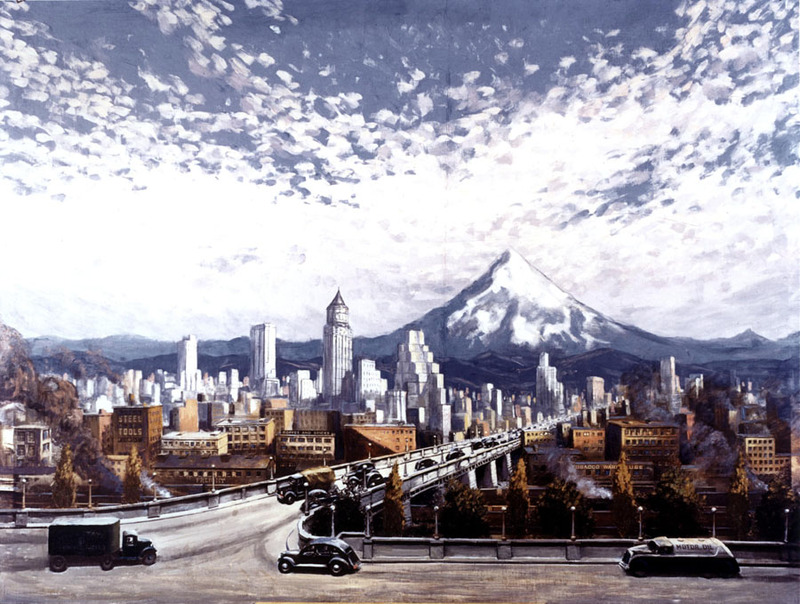 Large&dash;scale highway projects of significance during WWII years were connected to the war effort. These projects were most often built in coordination with other countries. 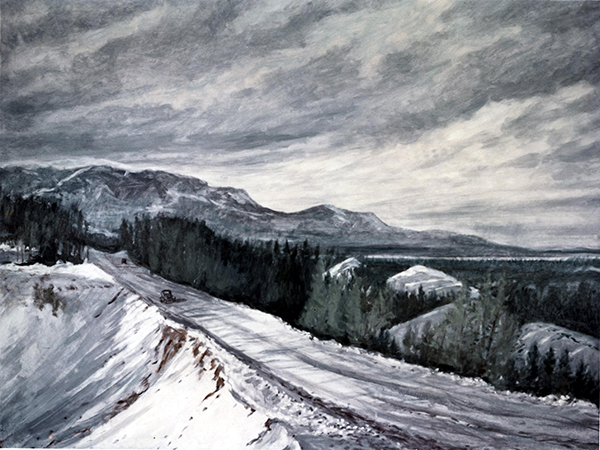 One of the most notable was the Alaska Highway. 1942 Alaska Highway built through Canada to Alaska for military purposes is completed. The attack on Pearl Harbor in Hawaii on December 7, 1941, raised a concern that the U.S. Territory of Alaska was vulnerable to Japanese attack. The Aleutian Islands off southwest Alaska were closer to Japan than any point in North America. Construction of a land route to Alaska, long supported by Alaskan officials, now became militarily crucial. The Alaska Highway would stretch northwest from Dawson Creek through Fort Nelson and Whitehorse in Canada, and via Tok Junction to Big Delta southeast of Fairbanks, Alaska. Canada supplied the right&dash;of&dash;way and waived customs duties, and the United States built and agreed to maintain the road during the war. The construction of the highway was a truly cooperative effort between the U.S. Army Corps of Engineers, Army engineering units, the PRA, and PRA contractors. The U.S. Army Corps of Engineers was to build the pioneer road, with Army engineering units and contractors furnished and directed by the PRA. The over&dash;1,500 mile pioneer road was constructed in rough terrain that included sub&dash;arctic tundra, rugged mountains, and virgin forests and was completed by October 1942. Many of the troops constructing the pioneer road were black soldiers who had been drafted into the Army since approval of the Selective Service Act of 1940. The permanent location of the Alaska Highway was constructed in 1943. The military road was turned over to Canada on April 1, 1946, and was opened to the general public in 1948. 1944 The Federal&dash;Aid Highway Act of 1944 establishes the first program for urban projects and authorizes the National System of Interstate Highways. In 1941, President Roosevelt appointed a National Interregional Highway Committee to investigate the development of a limited&dash;access, national system of highways to improve interregional transportation. In 1943, the Interregional Highway report was completed, which proposed six possible combinations of interregional routes within a nearly 34,000&dash;mile system of roads, 4,500 miles within cities and 29,500 miles in rural areas. The proposed system was estimated to comprise a little over 1 percent of total street and highway miles, but would carry 20 percent of all vehicle miles traveled. As rural roads were expected to carry much less traffic, they would be built with only two lanes. Standards were recommended and an estimated cost was proposed of $500 million per year in rural areas and $250 million per year in urban areas. The interregional highway was one of a number of postwar highway proposals used to develop the Federal&dash;aid highway system. The Federal&dash;Aid Act of 1944 authorized a 40,000&dash;mile National System of Interstate Highways, but did not provide funds for its construction. The interstate would retain many elements of the federal&dash;state partnership and satisfy the public&apos;s demand for long&dash;distance highways; however, it would not be until 12 years later that such a system would be built. 1947 Interstate System announced following coordination with states and Department of Defense. PRA Commissioner Thomas MacDonald and Federal Works Administrator Philip Fleming announced selection of the first 37,700 miles. The routes had been proposed by the state highway agencies and reviewed by the Department of Defense. 1949 PRA becomes Bureau of Public Roads &lpar;BPR&rpar;, moves to Department of Commerce. The Works Project Administration was abolished in 1943. In 1947, President Harry S. Truman appointed the first Hoover Commission to study the functions of the federal government and recommend administrative and managerial changes. In the period following World War II, various agencies were consolidated, which finally led to the dismantling of the Federal Works Administration. PRA was renamed BPR and moved to the Department of Commerce. 1952 Federal&dash;Aid Highway Act of 1952 authorizes first funding specifically for Interstate System. While the Federal&dash;Aid Highway Act of 1944 established and authorized the National System of Interstate Highways, it did not provide funds for its construction. The Federal&dash;Aid Highway Act of 1952 authorized the first funding specifically for the Interstate System, a token amount of $25 million, on a 50&dash;50 matching basis. 1954 Federal—Aid Highway Act of 1954 authorizes $175 million a year for Interstate System. The 1954 bill authorized $175 million for the Interstate System, to be used on a 60&dash;40 matching ratio. The formula represented a compromise&colon; one&dash;half based on population and one&dash;half based on the federal&dash;aid primary formula &lpar;one&dash;third on roadway distance, one&dash;third on land area, and one&dash;third on population&rpar;. During the signing ceremony at the White House, President Dwight D. Eisenhower said, “This legislation is one effective forward step in meeting the accumulated needs.” However, he knew it was not a big enough step, and he decided to do something about it. 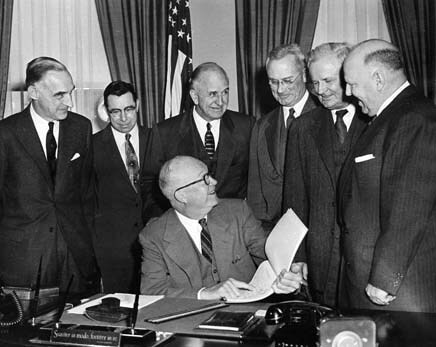 1956 The Federal&dash;Aid Highway Act of 1956 1s signed, creating the Highway Trust Fund. President Dwight D. Eisenhower receives members of the President&apos;s Advisory Committee on a National Highway Program on January 11, 1955. Photo Credit&colon; Dwight D. Eisenhower Library. While in office, President Dwight D. Eisenhower formed the National Highway Program Advisory Committee; which became known as the “Clay Committee” after General Lucius Clay, who Eisenhower placed in charge of proposing a financing mechanism for the Interstate System. The Clay Committee surmised that because the interstate was predominantly national in scope and function, the federal government should pay for most of its cost. As a result, the federal share would be increased to 90 percent on interstate roads. The committee also proposed to finance the system through bonds backed by expected increases in gas tax revenue. This proposal sparked ongoing debate between the U.S. Senate and House as some representatives did not favor debt financing as a way to pay for the interstate. Instead, a decision was made to create a fund credited with revenue from highway user taxes &lpar;primarily gas&rpar; for paying expenses solely from the highway program. Created by the Highway Revenue Act of 1956, it became known as the Highway Trust Fund. Interstate funds would be apportioned to states based on road mileage, population, and land area. In addition, the 1956 Federal&dash;Aid Highway Act would require that the interstate be designed to a uniform set of standards and to accommodate a 20&dash;year traffic forecast. The PRA would work with AASHO to develop minimum standards that would ensure uniformity of design, full control of access, and elimination of highway and railroad&dash;highway grade crossings. By the summer of 1957, construction of the interstate was underway and would continue for another 40 years. 1958 The first Interstate Cost Estimate &lpar;ICE&rpar; is released. 1958 The Federal&dash;Aid Highway Act of 1958 is signed, increasing funding for the Interstate System. To stimulate the economy and avoid losing momentum on development of the Interstate System, Congress passed the Federal&dash;Aid Highway Act of 1958. It increased interstate funding by a total of $800 million for fiscal years 1959 to 1961 and included an emergency increase of $400 million for the Federal&dash;aid systems &lpar;primary, secondary, and urban&rpar; in fiscal year 1959. The federal share of projects developed with the emergency funds was increased to 66.6 percent &lpar;instead of 50 percent&rpar;, with an additional $115 million authorized to advance to states that needed help matching the federal share, to be repaid from future apportionments. The act also suspended the provision of the 1956 act that required the Commerce Secretary to hold apportionments to an amount that would not result in a deficit in the Highway Trust Fund. 1959 The Federal&dash;Aid Highway Act of 1959 is signed, increasing revenue to the Highway Trust Fund. The Federal&dash;Aid Highway Act of 1959, signed by President Dwight D. Eisenhower, increased the gas tax by 1 cent &lpar;to 4 cents&rpar; through June 30, 1961, and reduced interstate authorizations for fiscal year 1961 to $2 billion. The additional revenue was intended to address shortfalls in the Highway Trust Fund as a result of the increased authorizations approved in 1958. 1962 The Federal&dash;Aid Highway Act of 1962 requires a cooperative, comprehensive, and continuing planning process on Federal&dash;aid projects. 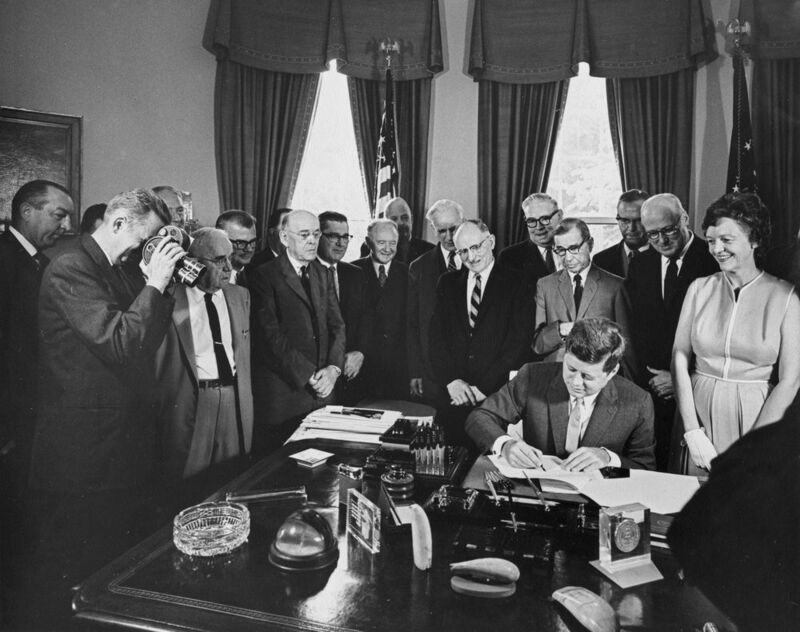 President John F. Kennedy signing the Federal&dash;Aid Highway Act of 1962. Photo Credit&colon; John F. Kennedy Presidential Library and Museum, Boston. The act, signed by President John F. Kennedy, included Section 9 “Transportation Planning in Certain Urban Areas,” which launched modern transportation planning by calling for “a continuing comprehensive transportation planning process carried on cooperatively.” What became known as the “3C” process remains the core of Title 23, United States Code, Section 134 &lpar;metropolitan transportation planning&rpar;. The act introduced metropolitan planning organizations &lpar;MPOs&rpar; to ensure that a transparent and comprehensive planning process, which involved public engagement, was used in the selection and planning of projects in urbanized areas with a population greater than 50,000. Federal funding for transportation projects and programs is channeled through this planning process. As of 2015, there were 408 MPOs in the United States. Since the formation of MPOs, greater emphasis has been placed on the integration of other modes of travel to alleviate congestion in higher&dash;density areas. Examples of infrastructure that supports a multimodal system include some of the following&colon; light rail placed in highway right&dash;of&dash;way; bus rapid transit lanes; dedicated bike lanes, paths and facilities; sidewalks and pedestrian walkways; and parking spaces for carpools. 1964 The Urban Mass Transportation Act is signed, providing funds for mass transportation systems. The act, signed by President Lyndon B. Johnson, provides additional assistance for the development of comprehensive and coordinated mass transportation systems, both public and private, in metropolitan and other urban areas. It provided $375 million for large&dash;scale urban public or private rail projects in the form of matching funds to cities and states. The Urban Mass Transportation Administration &lpar;now the Federal Transit Administration&rpar; was created. It provided capital grants for up to 50 percent of the cost of transit improvements. President Lyndon B. Johnson signing the Highway Beautification Act. Photo Credit&colon; Lyndon Baines Johnson Library and Museum, Austin. The act, signed by President Lyndon B. Johnson, called for control of outdoor advertising, including removal of certain types of signs, along the Interstate Highway System and the existing Federal&dash;aid primary highway system. It also required certain junkyards along interstate or primary highways to be removed or screened and encouraged scenic enhancement and roadside development. 1966 The Highway Safety Act &lpar;setting highway safety standards&rpar; and the National Traffic and Motor Vehicle Safety Act &lpar;authorizing vehicle performance standards&rpar;, are signed. 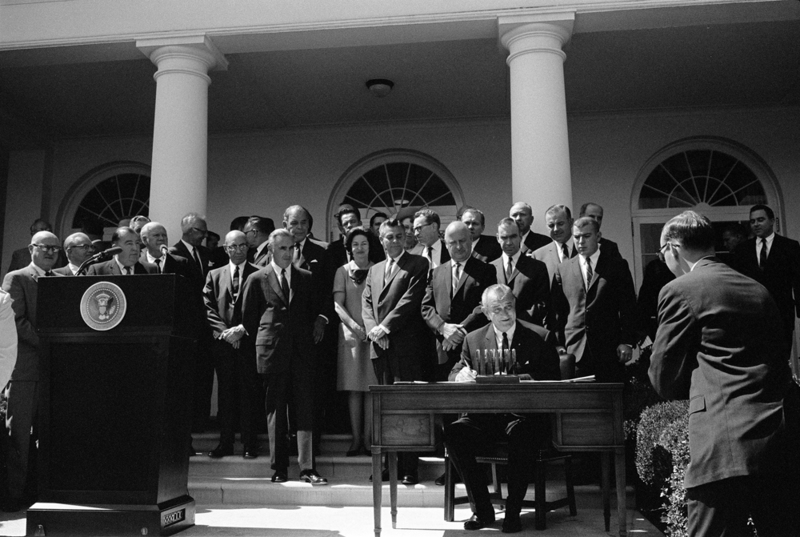 President Lyndon B. Johnson signing the National Traffic and Motor Vehicle Safety Act. Photo Credit&colon; Lyndon Baines Johnson Library and Museum, Austin. The Highway Safety Act, signed by President Lyndon B. Johnson, set highway safety standards and required all states to create a highway safety program and to adhere to uniform standards promoted by the U.S. DOT as a condition of receiving Federal&dash;aid funds. The act created the National Highway Safety Bureau &lpar;now the National Highway Traffic Safety Administration&rpar;. The National Traffic and Motor Vehicle Safety Act empowered the federal government to set and administer new safety standards for motor vehicles and road traffic safety and made the installation of seatbelts in motor vehicles mandatory. 1967 BPR becomes Federal Highway Administration &lpar;FHWA&rpar;. The U.S. Department of Transportation &lpar;DOT&rpar; was established by an act of Congress on October 15, 1966, and began operation on April 1, 1967. The Federal Highway Administration &lpar;FHWA&rpar; was created as an agency within the DOT. FHWA was not simply a new name for BPR. It consisted of four bureaus. One bureau, BPR, continued to administer the Federal&dash;Aid Highway Program. The National Traffic Safety Bureau promulgated vehicle performance standards under the Traffic Safety Act while the National Highway Safety Bureau was responsible for highway safety standards under the Highway Safety Act. In addition, FHWA included the Bureau of Motor Carrier Safety, which had jurisdiction over the safety of 3 million trucks and buses. In 1970, the Traffic Safety Bureau separated from FHWA to become the National Highway Traffic Safety Association &lpar;NHTSA&rpar;. BPR ceased to exist when FHWA reorganized in 1970 to eliminate the bureau structure. 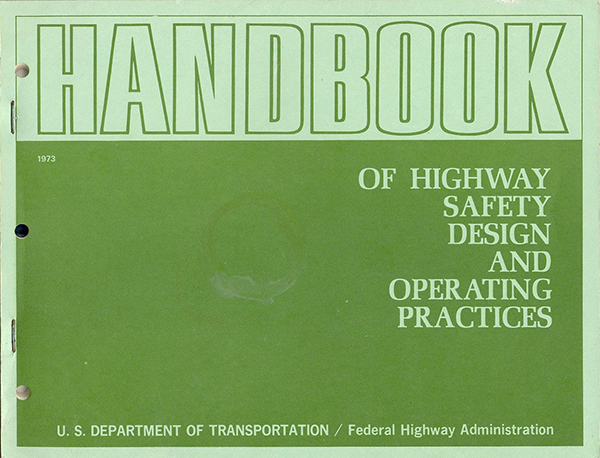 1968 FHWA announces publication of the Handbook of Highway Safety Design and Operating Practices. The Handbook of Highway Safety Design and Operating Practices presents the latest safety techniques for bridge design, signing, barriers and guardrail, drainage, and railroad crossings. The handbook used illustrations with minimum narrative to present known solutions for a wide variety of design and operating conditions associated with highway hazards. 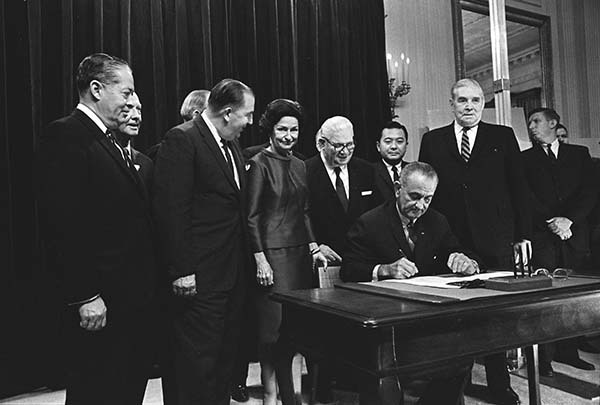 1968 Federal&dash;Aid Highway Act of 1968 is signed, establishing a National Bridge Inspection Program, funding and fair housing standards for those displaced by federally funded highway construction, and a traffic operations study program. The Federal&dash;Aid Highway Act of 1968 signed by President Lyndon B. Johnson created a national bridge inspection program. All bridges constructed with federal funds, or which carried a federally funded road, were required to be inspected based on DOT&dash;established standards for bridge safety. The act also created a new program to assist states in aiding families displaced by urban highway construction. Families could only be relocated with federal funds if the new housing was not in a crime&dash;ridden neighborhood, was environmentally sound, and had good&dash;quality sanitation &lpar;plumbing, sewage, etc.&rpar;. The act established a revolving fund for states to use in acquiring rights&dash;of&dash;way for future highway construction. The Traffic Operations Program to Improve Capacity and Safety &lpar;TOPICS&rpar; program was established to help states and localities collect data on, analyze, and work to reduce traffic congestion and improve traffic flow in urban areas. The act required that the DOT and states hold two public hearings &lpar;one on site planning, one on design&rpar; on the economic, environmental, and social impact of federally funded highway construction. Highway construction projects were required to comply with the provisions of the Civil Rights Act of 1964. The act required states to sign Equal Employment Opportunity &lpar;EEO&rpar; Assurances in order to receive federal highway funds. 1969 The National Environmental Policy Act of 1969 develops the Environmental Impact Statement. President Richard M. Nixon signing the National Environmental Policy Act &lpar;NEPA&rpar;. Photo Credit&colon; U.S. Department of Agriculture. The National Environmental Policy Act &lpar;NEPA&rpar;, signed into law by President Richard M. Nixon in 1970 and often referred to as the Magna Carta of the nation&apos;s environmental laws, required federal agencies to consider environmental impacts before taking significant action on federal programs. The act also established the President&apos;s Council on Environmental Quality &lpar;CEQ&rpar;. The NEPA process is the evaluation of the relevant environmental effects of a federal project. This process begins when an agency develops a proposal addressing a need to take action. If it is determined that the proposed action is covered under NEPA, there are three levels of analysis that a federal agency must undertake to comply with the law. These three levels include the preparation of a Categorical Exclusion &lpar;CatEx&rpar;, an environmental assessment &lpar;EA&rpar;, a Finding of No Significant Impact &lpar;FONSI&rpar;, and, finally, the preparation and drafting of an environmental impact statement &lpar;EIS&rpar;. In 1994, President William J. Clinton signed Executive Order 12898, which directed federal agencies to identify and address the adverse effects of federal projects on the health and environment of minority and low&dash;income populations. These became known as environmental justice &lpar;EJ&rpar; requirements to include an evaluation of the potential social and economic impacts of a proposed transportation project through the NEPA review. 1970 Highway Users Federation for Safety and Mobility is formed. 1970 National Highway Institute &lpar;NHI&rpar; is established. 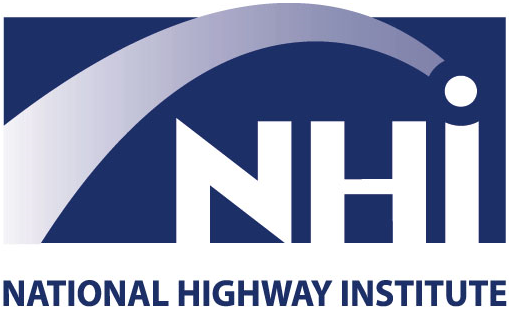 The National Highway Institute &lpar;NHI&rpar; is the training and education arm of FHWA. Since being established by Congress in 1970, NHI has provided numerous trainings to the transportation community in 18 learning areas from structures and pavements to real estate and communications. Because of the global nature of transportation today, NHI reaches beyond the nation&apos;s borders to develop relationships with transportation professionals around the world. For more than 20 years, NHI and FHWA&apos;s Office of International Programs have collaborated to provide training to dozens of countries, including Iraq, Korea, and Kuwait. Together, NHI and its partners support the training and educational needs of the transportation workforce. 1970 Special Bridge Replacement Program is established under the Federal&dash;Aid Highway Act of 1970. The Special Bridge Replacement Program was established under the Federal&dash;Aid Highway Act of 1970 following the collapse of the U.S. 35 Silver Bridge on the Ohio River between Point Pleasant, West Virginia, and Gallipolis, Ohio. The first annual report from the program was provided to Congress in 1972. The report indicated that out of 563,500 bridges, 88,900 were considered critically deficient, 24,000 of which were on the Federal&dash;Aid Highway system. The act also had a provision that called for “standards of highway noise levels compatible with different land uses.” FHWA issued the first regulations on noise abatement, implementing this provision in 1976. 1971 Manual on Uniform Traffic Control Devices &lpar;MUTCD&rpar; is approved by FHWA as national standards. The standardization of signs and devices on the highway system promoted greater familiarity and was designed to guide, warn, and inform drivers. Traffic control devices include signs, pavement markings, roadside delineators, and traffic signals. In 1971, MUTCD was approved by the FHWA as the national standard for all highways open to public travel. The manual is widely used by practitioners as guide for implementing standards for design, location, installation, and operation of all forms of traffic control devices and is updated periodically. The National Committee on Uniform Traffic Control Devices advises the FHWA on additions, revisions, and changes to the MUTCD. 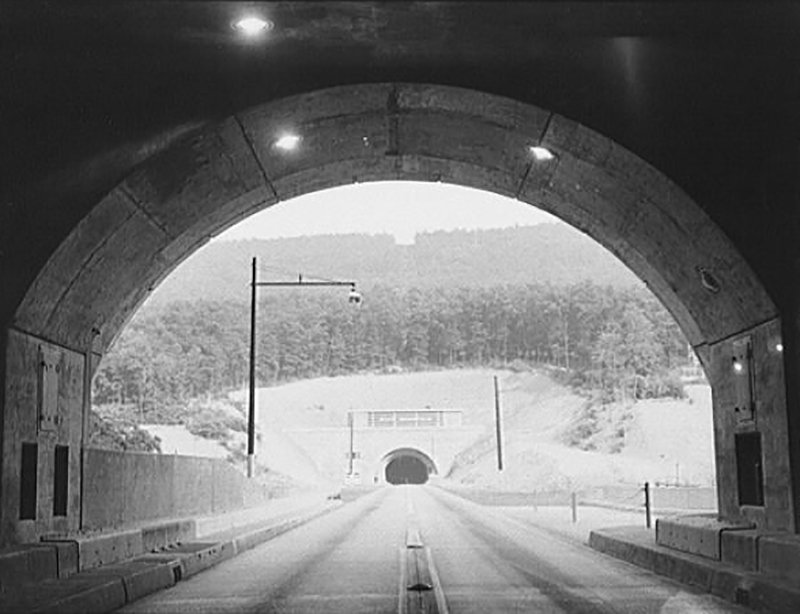 1973 Eisenhower Memorial Tunnel on I&dash;70 opens in Colorado. Construction of the Eisenhower Memorial Tunnel in the early 1970s. Photo Credit&colon; Colorado Department of Transportation. 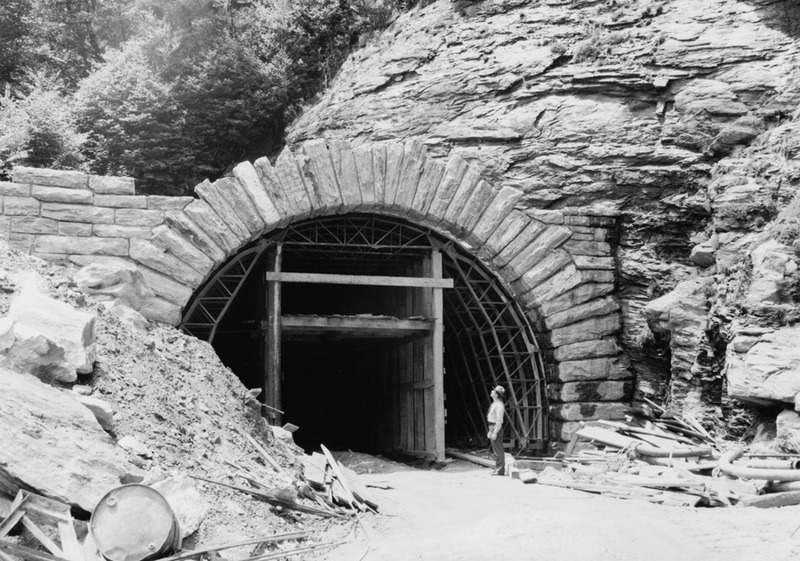 The Eisenhower/Johnson Memorial Tunnels and the Glenwood Canyon Project represent successful partnerships between the FHWA and the state of Colorado to complete the U.S. Interstate System and spur economic growth in the region. The projects were largely funded with federal dollars and have become a major contributor to the safe movement of people and goods across the Continental Divide and to the Colorado tourism industry. Mountain tunnels provide freer movement of people and goods through otherwise difficult terrain. The Eisenhower/Johnson Memorial Tunnels, the highest vehicular tunnels in the world, are key features of Interstate 70 in Colorado. They improve connectivity, travel safety, and reliability between east and west by uniting the state through the Rocky Mountains and the Continental Divide. Interstate 70 has had tremendous impact on tourism in Colorado and improved the efficiency and safety of movement of people and goods through the Rocky Mountains. It has also enabled both residential and commercial development in mountain areas along the route. 1973 The Federal&dash;Aid Highway Act of 1973 funds a highway safety improvement program and permits states to withdraw segments from the Interstate System to fund mass transit. The Federal&dash;Aid Highway Act of 1973, signed by President Richard M. Nixon, authorized the Interstate Withdrawal and Substitution Program. Under this program, a mayor and governor could ask the Secretary of Transportation to withdraw urban segments from the Interstate System. When withdrawals were approved, funds from the general Treasury &lpar;not the Highway Trust Fund&rpar; equal to the estimated cost of the segment could be used for mass transit, including rapid rail transit. This legislation gave cities a way to cancel controversial interstate segments without losing millions of dollars in federal funds. Later, legislation broadened the program to allow use of substitute funds from the Highway Trust Fund for substitute highway improvements. In 1974, FHWA issues guidelines authorizing the use of Federal&dash;aid highway funds for construction of bikeways and pedestrian walkways outside the highway right&dash;of&dash;way along Federal&dash;aid highways as authorized by the 1973 Federal&dash;Aid Highway Act. 1973 AASHO broadens mission and is renamed the American Association of State Highway and Transportation Officials &lpar;AASHTO&rpar;. AASHO&apos;s Policy Committee approves a new name, “American Association of State Highway and Transportation Officials,” and a broadened mission and membership to include all forms of transportation—not just highways. 1974 The Emergency Highway Energy Conservation Act is signed to reduce oil consumption. 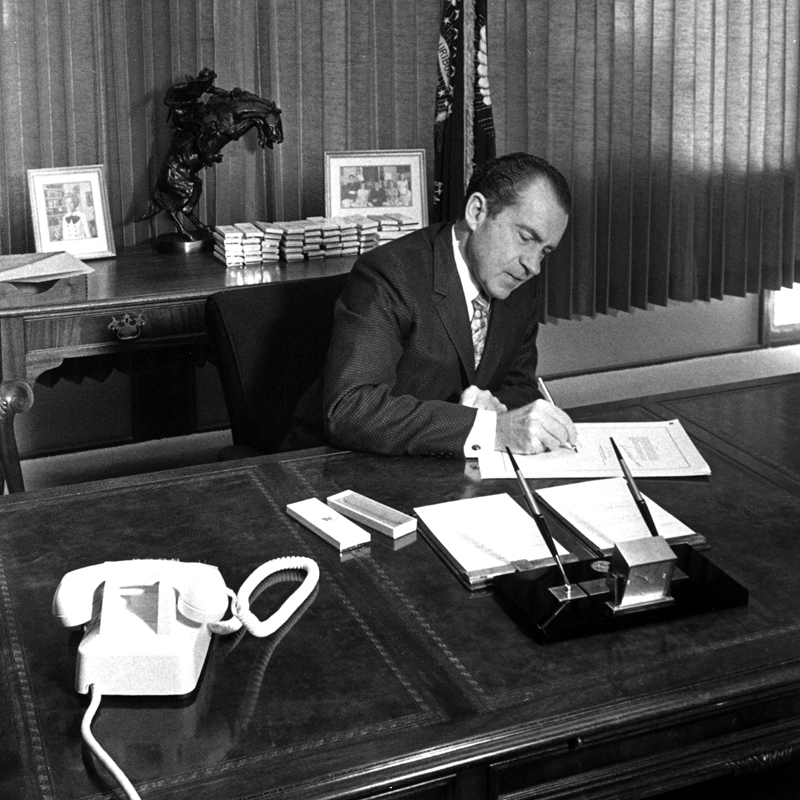 The Emergency Highway Energy Conservation Act is signed by President Richard M. Nixon to reduce oil consumption. The act prohibited FHWA from approving Federal&dash;aid projects in any state that had a speed limit over 55 mph. 1975 Corporate Average Fuel Economy &lpar;CAFE&rpar; standards are enacted in response to the oil crisis resulting from the oil embargo. The Corporate Average Fuel Economy &lpar;CAFE&rpar; standards were signed by President Gerald R. Ford after the 1973&dash;74 Arab Oil Embargo to improve the average fuel economy of cars and light trucks &lpar;trucks, vans, and sport utility vehicles&rpar; produced for sale in the United States. 1976 “Highways of History” exhibit opens in Old Pension Building, Washington D.C.
One of Carl Rakeman's paintings “Viaducts in Cities” displayed at the “Highways of History” exhibit. Photo Credit&colon; Federal Highway Administration. 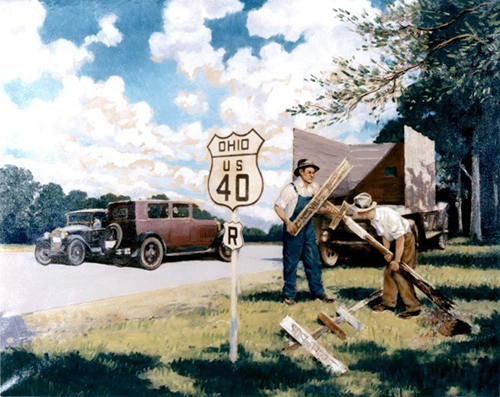 The “Highways of History” exhibit displayed the series of 109 paintings by Carl Rakeman of the Bureau of Public Roads. 1980 Haddon Matrix adopted for crash site analysis. 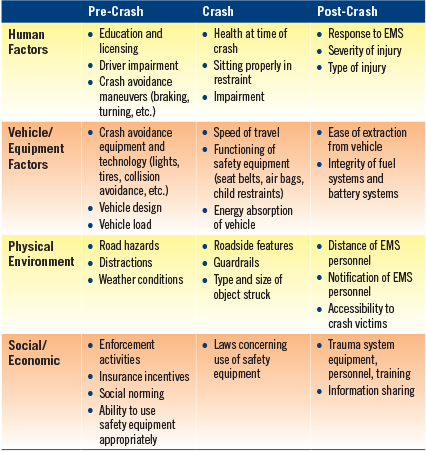 Haddon Matrix with examples of safety efforts. Photo Credit&colon; NHTSA. Research at the national level has made significant contributions to improving roadway safety infrastructure and analysis. In 1980, the Haddon Matrix &lpar;developed by William Haddon in 1970&rpar; became the most commonly used approach for analyzing a crash site and developing countermeasures or interventions that could have been implemented to reduce the likelihood or lesson the severity of the collision. The matrix provides a range of potential issues addressed through a variety of counter&dash;measures, including education, enforcement, engineering, and emergency response solutions. Recent innovations as a result of investment in roadway safety and design have produced a number of safety features that have been implemented in areas across the nation, including alternative intersection designs such as roundabouts, rumble strips, reduced pavement edge drop&dash;offs, and the application of high&dash;friction surface treatments at critical locations. In addition, the collection of electronic roadway and crash data has provided insight into better understanding characteristics of high&dash;risk crash locations and strategies for mitigation. 1983 Surface Transportation Assistance Act is signed, adding revenue to be used for repair of highways and bridges. President Ronald W. Reagan signs the Surface Transportation Assistance Act &lpar;STAA&rpar;. Photo Credit&colon; Ronald Reagan Presidential Library and Museum. 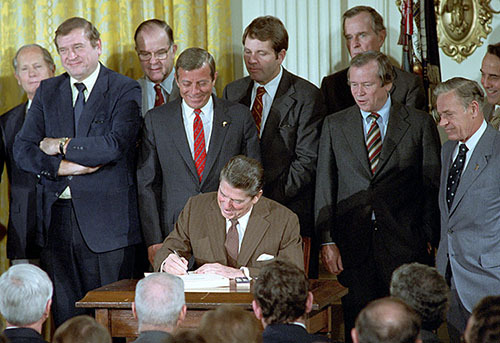 The Surface Transportation Assistance Act of 1982 &lpar;STAA&rpar; was a 4&dash;year bill that was signed by President Ronald W. Reagan in 1983. On the highway side, gas taxes and certain other user taxes were increased significantly &lpar;Highway Trust Fund revenues were increased by about $6.5 billion per year&rpar;. Most of these increases were directed toward interstate completion, interstate 4R &lpar;resurfacing, restoration, rehabilitation, and reconstruction&rpar; and bridge programs. The STAA established a Mass Transit Account in the Federal Highway Trust Fund as a source for funding capital expenditures and diminished the emphasis on operating assistance. The Federal Lands Highway Program &lpar;FLHP&rpar; was also established under the act to provide funding for more than 90,000 miles of federal and public roads. 1984 The Motor Carrier Safety Act is signed, directing DOT to reissue the Federal Motor Carrier Safety Regulations. The Motor Carrier Safety Act of 1984, signed by President Ronald W. Reagan, directs the DOT to establish rules, regulations, standards, and orders to assure that&colon; &lpar;1&rpar; commercial motor vehicles are safely maintained, equipped, loaded, and operated; &lpar;2&rpar; the responsibilities imposed upon drivers of commercial motor vehicles do not impair such drivers&apos; ability to operate safely; &lpar;3&rpar; the physical condition of such drivers is adequate to enable them to drive safely; and &lpar;4&rpar; the operation of commercial motor vehicles does not create deleterious effects on the physical condition of such drivers. 1986 The Commercial Motor Vehicle Safety Act is signed, giving FHWA new tools to enhance commercial vehicle safety. President Ronald W. Reagan signs the Commercial Motor Vehicle Safety Act, giving FHWA new tools to enhance commercial vehicle safety, including a requirement that bus and truck drivers have a single commercial driver&apos;s license based on uniform testing standards; creation of a central clearinghouse for complete driving records; and mandatory penalties for serious traffic violations and felony convictions. 1990 Interstate 10 and the Papago Freeway Tunnel in Arizona completed. 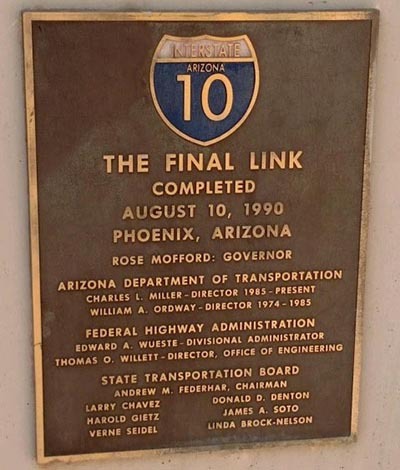 Plaque commemorating the completion of Interstate 10. Photo Credit&colon; Arizona Department of Transportation. The original plans followed an alignment through a section of downtown Phoenix that could have disrupted established neighborhoods. Planners created several designs to accommodate local traffic and minimize impact on the community, including an elevated freeway. Phoenix residents chose instead to go underground. The Papago Freeway Tunnel is a 6&dash;block, 2,887&dash;foot section of roadway that travels below grade and supports 13 acres of a 30&dash;acre park above. The “tunnel” is actually a series of bridges that are connected side by side to cover the section of Interstate 10. It allowed completion of Interstate 10 and provided a public green space for Phoenix residents. In 2015, the tunnel carried more than 230,000 vehicles, including 11,000 trucks, per day. 1991 Intermodal Surface Transportation Efficiency Act &lpar;ISTEA&rpar; is signed to improve highways and bridges and focus federal funds on highways that serve federal interests and increase state and local authority. The Intermodal Surface Transportation Efficiency Act &lpar;ISTEA&rpar; signed by President George H. W. Bush presented an overall intermodal approach to highway and transit funding with collaborative planning requirements, giving significant additional powers to metropolitan planning organizations. The act also mandated that passenger automobiles and light trucks built after September 1, 1998, have airbags installed as standard equipment for the driver and the right&dash;front passenger. 1994 American Society of Civil Engineers &lpar;ASCE&rpar; designates the Interstate System as one of the “Seven Wonders of the United States." 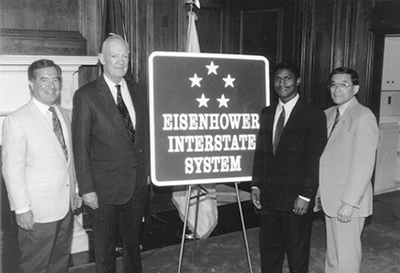 Unveiling the Eisenhower Interstate System sign in 1993 with John Eisenhower &lpar;President Eisenhower&apos;s son&rpar;. Photo Credit&colon; Federal Highway Administration. In October 1990, President George H. W. Bush signed legislation that changed the name of the Interstate System to the “Dwight D. Eisenhower System of Interstate and Defense Highways.” In February 1994, the American Society of Civil Engineers &lpar;ASCE&rpar; designated the Dwight D. Eisenhower System of Interstate and Defense Highways as one of the “Seven Wonders of the United States.” &lpar;Other “wonders” include the Golden Gate Bridge, Hoover Dam, and the Panama Canal.&rpar; As ASCE noted, the Interstate System has often been called “the greatest public works project in history” and “the backbone of the world&apos;s strongest economy.” It not only linked the nation, but it boosted productivity and helped sustain a more than tenfold increase in the gross national product since the start of the program in 1956. 1995 National Highway System Designation Act of 1995 is signed. President William J. Clinton signed the National Highway System Designation Act of 1995, which designates about 160,955 miles of roads, including the Interstate Highway System, as the National Highway System &lpar;NHS&rpar;. The act gave Congress the power to prioritize highway system projects, repealed all federal speed limit controls, and prohibited the federal government from requiring states to use Federal&dash;aid highway funds to convert existing signs or purchase new signs with metric units. 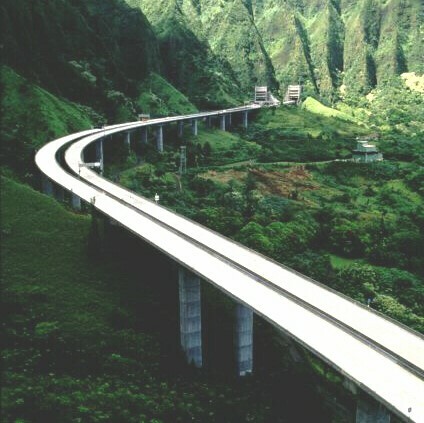 1997 Construction of Interstate H&dash;3 is completed in Hawaii. H&dash;3&apos;s curvilinear alignment crosses extremely rugged terrain as it enters Hawaii&apos;s longest highway tunnels. Photo Credit&colon; Federal Highway Administration. Interstate H&dash;3 in Hawaii was built to connect military bases. The eastern end of the highway is the Marine Corp Bases Hawaii &lpar;MCBH&rpar; and the western end is the U.S. Navy port at Pearl Harbor off Interstate H&dash;1. Section 105 of the Federal&dash;Aid Highway Act of 1959 directed the Secretary of Commerce, where the BPR was located at the time, to study the need for interstate routes in Alaska and Hawaii. After identifying possible routes, the BPR evaluated them according to the same criteria applied during a 1957 expansion of the Interstate System&colon; national defense; system integration &lpar;the value of the route as a connector between centers of population and industry&rpar;; service to industry, fishing, agriculture, mining, and forestry, as measured by the value of products or by traffic data; and population. In addition to the defense&dash;access purpose, the highway provides much&dash;needed safety and capacity improvements for the traveling public as a whole. The Hawaii DOT completed H&dash;3 in 1997, with the dedication ceremony held on December 12, 1997. Much of the funding for the project was through federal funds. H&dash;3 is an engineering wonder, and is considered by many as one of the nation&apos;s most spectacular mountain drives. 1998 Transportation Equity Act for the 21st Century &lpar;TEA&dash;21&rpar; is signed, requiring an increase in the safety, accessibility, conservation, efficient system management and operation, and efficient preservation of existing transportation systems. President William J. Clinton signs the Transportation Equity Act for the 21st Century &lpar;TEA&dash;21 Act&rpar;. Photo Credit&colon; John Collins, ITS America. 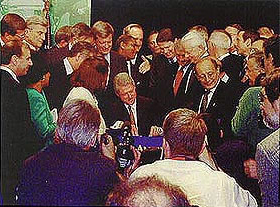 In 1998, President William J. Clinton signed the Transportation Equity Act for the 21st Century &lpar;TEA&dash;21&rpar; authorizing highway, highway safety, transit, and other surface transportation programs for 6 years. The act guaranteed $198 billion in surface transportation investment in highways, transit, intermodal projects, and technologies such as Intelligent Transportation Systems. The act provided incentive grants to increase seatbelt use and to fight drunk driving by encouraging states to adopt 0.08 blood alcohol concentration standards. The act required that seven planning factors be included in regional transportation plans. The plans must&colon; &lpar;1&rpar; support the economic vitality of the metropolitan planning area, especially by enabling global competitiveness, productivity, and efficiency; &lpar;2&rpar; increase the safety and security of the transportation system for motorized and non&dash;motorized users; &lpar;3&rpar; increase the accessibility and mobility options available to people and for freight; &lpar;4&rpar; protect and enhance the environment, especially by promoting energy conservation and improving quality of life; &lpar;5&rpar; enhance the integration and connectivity of the transportation system across and between transport modes for people and freight; &lpar;6&rpar; promote efficient system management and operation; and &lpar;7&rpar; emphasize the efficient preservation of existing transportation systems. 2005 Safe, Accountable, Flexible, Efficient Transportation Equity Act&colon; A Legacy for Users &lpar;SAFETEA&dash;LU&rpar; was signed, authorizing Federal&dash;aid highway, transit, and safety programs through fiscal year 2009. 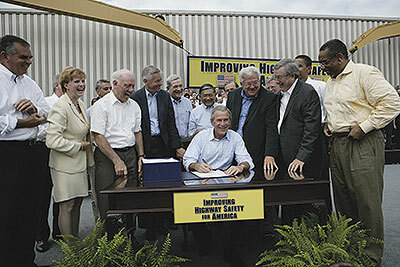 President George W. Bush signs the Safe, Accountable, Flexible, Efficient Transportation Equity Act&colon; A Legacy for Users &lpar;SAFETEA&dash;LU&rpar; at a Caterpillar facility in Illinois. Photo Credit&colon; White House photo by Eric Draper. President George W. Bush signed the Safe, Accountable, Flexible, Efficient Transportation Equity Act&colon; A Legacy for Users &lpar;SAFETEA&dash;LU&rpar; in 2005 guaranteeing $244 billion in funding for highways, highway safety, and public transportation. SAFETEA&dash;LU established a new core Highway Safety Improvement Program structured and funded to make significant progress in reducing highway fatalities. The act doubled funds for infrastructure safety and required strategic highway safety planning, focusing on results, on Federal&dash;aid projects. SAFETEA&dash;LU established the Highways for LIFE pilot program to advance longer&dash;lasting highways using innovative technologies and practices to speed up the construction of efficient and safe highways and bridges. 2009 American Recovery and Reinvestment Act &lpar;ARRA&rpar; is signed, as a stimulus package in response to the Great Recession. 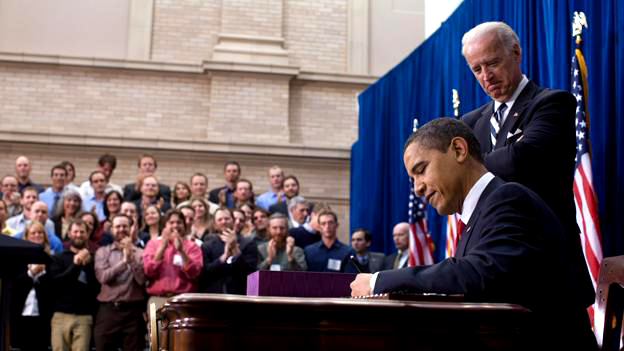 President Barack H. Obama signs the American Recovery and Reinvestment Act &lpar;ARRA&rpar;. Photo Credit&colon; Official White House photo. The American Recovery and Reinvestment Act &lpar;ARRA&rpar; was signed by President Barack H. Obama to stimulate the economy following the Great Recession. The $787 billion economic stimulus package included tax cuts and infrastructure, education, health care, and unemployment assistance, among other items. The act included $28 billion for highway and bridge construction and repair and $12 billion for mass transit and rail projects. 2009 Every Day Counts &lpar;EDC&rpar; innovation initiative launched by FHWA. In 2009, FHWA launched Every Day Counts &lpar;EDC&rpar; in cooperation with AASHTO to speed up the delivery of highway projects and to address the challenges presented by limited budgets. EDC is a state&dash;based model to identify and rapidly deploy proven but underutilized innovations to shorten the project delivery process, enhance roadway safety, reduce congestion, and improve environmental sustainability. Through the EDC model, FHWA works with state and local transportation agencies and industry stakeholders to identify a new collection of innovations to champion every 2 years. Innovations are selected collaboratively by stakeholders, taking into consideration market readiness, impacts, benefits, and ease of adoption of the innovation. After selecting the EDC technologies for deployment, transportation leaders from across the country gather at regional summits to discuss the innovations and share best practices. These summits begin the process for states, local public agencies, and Federal Lands Highway divisions to focus on the innovations that make the most sense for their unique program needs, establish performance goals, and commit to finding opportunities to get those innovations into practice over the next 2 years. Throughout the 2&dash;year deployment cycle, specifications, best practices, lessons learned, and relevant data are shared among stakeholders through case studies, webinars, and demonstration projects. The result is rapid technology transfer and accelerated deployment of innovation across the nation. The first deployment cycle, EDC&dash;1, ran from 2011&dash;2012. EDC is now in its fourth deployment cycle, EDC&dash;4 &lpar;2017&dash;2018&rpar;. 2012 Moving Ahead for Progress in the 21st Century &lpar;MAP&dash;21&rpar; Act is signed, authorizing highway funding for 2 years. The Moving Ahead for Progress in the 21st Century &lpar;MAP&dash;21&rpar; Act was signed by President Barack H. Obama, authorizing $105 billion over two years. Under the act, the environmental review process was reformed in an effort to speed up project development. The act also required a national freight policy to be developed. 2015 Fixing America&apos;s Surface Transportation &lpar;FAST&rpar; Act is signed, authorizing $305 billion over a 5&dash;year period. Fixing America&apos;s Surface Transportation &lpar;FAST&rpar; Act was signed by President Barack H. Obama authorizing $305 billion over a 5&dash;year period from 2016 to 2020 for highway, rail, public transportation, highway and vehicle safety, and research and technology. The FAST Act established and funded new programs to support critical transportation projects to ease congestion and facilitate the movement of freight on the Interstate System and other major roads. Programs include developing a new National Multimodal Freight Policy, apportioning funding through a new National Highway Freight Program, and authorizing a new discretionary grant program for Nationally Significant Freight and Highway Projects &lpar;FASTLANE Grants&rpar;. Building on the reforms of MAP&dash;21 and FHWA&apos;s Every Day Counts initiative, the FAST Act incorporates changes aimed at ensuring the timely delivery of transportation projects. These changes are to improve innovation and efficiency in the development of projects, through the planning and environmental review process, to project delivery. 2017 Interstate 44, Missouri, Park Over the Highway &lpar;CityArchRiver&rpar; scheduled to be completed. Construction of the bridge for the park over I&dash;44, which runs beneath the structure. 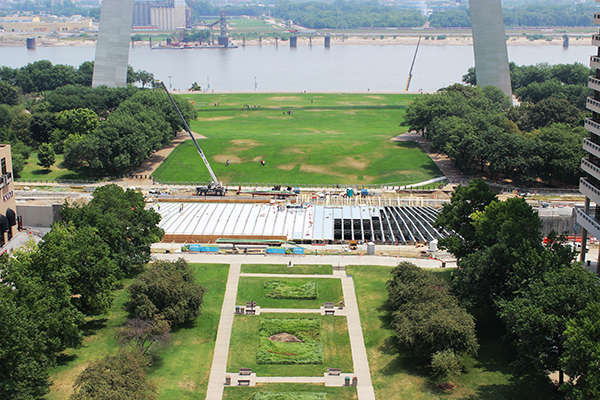 Photo Credit&colon; CityArchRiver Foundation. The St. Louis Gateway Arch was built in 1965, and then was soon cut off from the rest of the city by Interstate 44, which in 2015 carried over 100,000 vehicles, including about 20,000 trucks, per day. The CityArchRiver project is reconnecting the Gateway Arch and the community. Public engagement and public&dash;private partnerships were key aspects of the planning process. The project included a dramatic Park Over the Highway that, for the first time since the construction of the interstate, allows visitors to walk from the Old Courthouse to the Arch grounds to the riverfront on one continuous greenway, without a curb or stair step in their way. Prior to construction of the Park Over the Highway, pedestrians had to cross two intersections to reach the Arch grounds. The CityArchRiver project is a public&dash;private partnership between a number of stakeholders, including the National Park Service, Missouri DOT, Great Rivers Greenway District, City of St. Louis, Bi&dash;State Development Agency, CityArchRiver Foundation, U.S. DOT, and others.